As a family of four, this year was our very first, official, family pumpkin-carving experience. With two young boys, the theme for our household was (of course) … SUPERHEROES! I’d like to note that my husband (who may have been more excited about the theme than the boys) was completely on board. Cover EVERYTHING in the general area with plastic garbage bags. 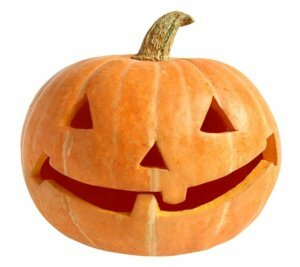 Get out all of our carving utensils (knife, scooper, and scraper), while still keeping them away from the kids. Added bonus: Backup support (aka grandparents) present. After beginning, we realized some of the challenges we had overlooked. The first was keeping our boys preoccupied, but still involved in the process, while we handled the “power tools”. Keeping a one-year-old and nearly-three-year-old “on track” for longer than 2 seconds can be… challenging. 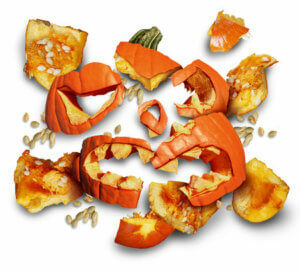 The grandparents swooped in to suggest letting them play with the pumpkin seeds and innards. And it was a hit! 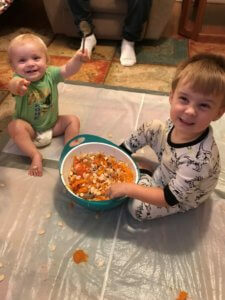 We gave each of them a bowl and spoons and let them squish, squash and get goop all over our covered floor. 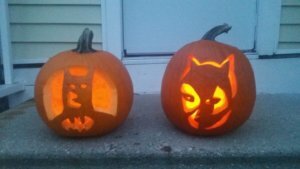 While they played, my husband and I were able to scoop, slice, and carve our superhero pumpkins. In the end, everyone was happy. We got our pumpkins carved and, if I do say so myself, they look fantastic. On top of that, it was a (relatively) mess-free and (totally) injury-free process. Planning and preparation (yaaay garbage bags!). The correct tools (in the right hands) to get the job done. Support system with years of expertise (the whole experience wouldn’t have gone as well without the help of seasoned grandparents). If you haven’t been through a specific process before, this seems to be a reliable approach for tackling nearly any new or important activity. And it seems that similar challenges, upgrades, and implementation processes are everywhere in both our personal and business lives. To create a “mess-free” system: Planning for, preparing, and learning everything you can BEFORE you begin is a first, and really important, part in achieving a positive outcome. Tools: Having the correct tools available, and placing them in the hands of the right people, at the right time, is critical. Backup support (the extra bonus). Think ahead! Ensure that, if you encounter unanticipated obstacles along the way, you’ll have the expertise you need, when you need it. What Kinds of New Processes Could be Good for YOUR Company? What would it be like if you could see, for each of your important jobs, how much you thought it would cost (by job stage), vs. what it’s actually costing? What might you be able to do with that information WHILE the job progresses? And AFTER the job has finished? What if you could easily access (without waiting for your CPA!) accurate monthly and year-to-date reports for your entire company, month-by-month, and quarter-by-quarter, throughout the year? How might that affect your decision-making and, ultimately, your profitability? Upon reflection, you may realize that you don’t have this information at hand. If so, and if you want to move your company to the next level, you’re likely going to need a job-cost accounting system. BUT – Why Try To Do It All By Yourself? Construction accounting and job-costing are valuable company-building tools. You don’t need to be a dyed-in-the-wool accountant to master them, but they ARE fairly complex. And, as in construction, these types of power tools placed in the hands of untrained staff members can create messy, less-than-favorable, (and often costly) results. If you want to learn how to get those useful job-cost and management reports, be sure to check out our Construction Accounting and Manufacturing Program (CAMP) online training solution. Planning, preparation, and educational videos. Videos, handouts, and other tools to help get the job done. Support: Monthly, one-to-one support each month. In our case, we knew better than to leave the results to chance, or to give pumpkin-carving tools to our wonderful, and (may I say?) super-intelligent offspring! Similarly, why not structure your process so that you get the top-notch training, resources, and expertise you need for YOUR super-intelligent company team BEFORE you begin the process? How Would You Rather See Your Financial Results Emerging From QuickBooks? Here’s to planning, preparation, and successful outcomes!